Peter Buckingham is Head of Distribution for the UK Film Council. He is also a friend of Circumference. Here are some more phrases from his speech to the 'Power to the Pixel' conference. The future is about having no gate keepers. Currently a film maker has to go through 7 gate keepers to reach the audience - festival pickers, distributors, exhibitors etc. Each gatekeeper picks films that they believe, with their experience, the audience will want to see. This is a system that obviously works so well that 75% of tickets are unsold. 1 - Free cinema screenings. Theatrical (ie cinema screenings) is just an advert for DVD sales anyway, where the big money is. And about 70p per person is already collected through advert sales. 4 - Use film as an advert for other 'real world' events. This is an idea from the music industry. Recorded music has become an freebie to get you to go to gigs where the big money is. Gigs can't really be pirated. They are 'analogue'. I really like Peter's 4 ideas. Circumference being closest to idea 1 I suppose. But I wonder if you added pop corn sales and extra merchandising ideas (like soundtrack / posters / DVDs of the film you've just seen) to it then you could possibly have a really free theatrical strategy. What would be the impact of that I wonder? I also wonder if idea 3, subscription models, could apply to theatrical instead of just DVDs? Similar to people who have a ticket to an opera season. Idea 4 was a new one to me. But I really go for it. But what could be the analogue / real world / events for cinema. What is the film equivalent of a gig? Last bit from Peter tomorrow. I was listening to this song. Hear the phone dialing sounds at the start of this song? I held it up to my phone. It rang. The number is the garage where I bought my car. Who'd have thought? What's all the mean? Nothing I guess. It's just a true story. I include this odd Sims video as it's an easy way to have the song on the blog. These guys are trying a 100% collective idea: "filmforay is about collaboratively creating a Hollywood film from the ground up. Right now we have no production deal and no Tinsel Town connections, and we like it that way!" Thanks to Stewart McKie for link. Am back from 3 days of learning and preaching to the converted and unconverted. Will report on more interesting things than the fact they spelt my name wrong over the days ahead. Thursday night at BAFTA for the writing for interactive media talk. Friday at the Power to the Pixel event. Saturday - just generally in London. 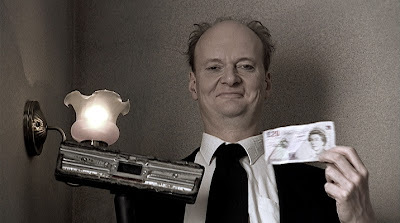 Saturday night - a talk by David Lynch at BAFTA. So jam packed - but room for a meet up. Let me know. Following on from this recent post the video abovee is illuminating. Why do we love storydust? 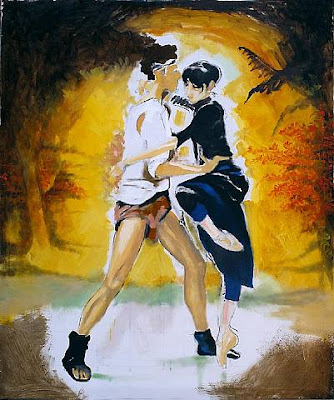 Why should we examine other art forms to help our inspiration? The clever brain doctor explains all. So listen. And realise that there is a medical, scientfic reason that the character you are writing reminds you of the texture of wire wool! Or is that just me! It's part of the London Film Festival and is a day focused on new distribution ideas - and all sorts of lovely Projector Films blog goodness that we talk about on here. It's like this blog - live! Not enough emphasis on how you script write for this type of media, but I guess I can ask about that. Hope to see you there. It's a bargain at £35. If you see me then say hello and I'll give you a Circumference trailer DVD! If you want to know about getting your film out there yourself and grab your own audience then go. If you're happy to leave it all to guys who take 50% and then just go and put your film on the shelf and leave it there - then don't go. 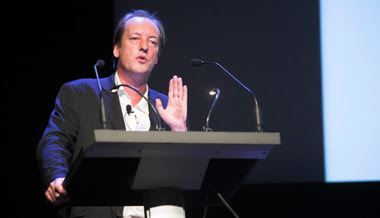 Peter Buckingham, Head of Distribution and Exhibition, UK Film Council who has supported us. Robert Greenwald, Director, Iraq For Sale , Walmart , Outfoxed . You can watch Outfoxed on Google Video (of course) here. Susan Buice & Arin Crumley, Directors, Four Eyed Monsters - which you can watch all of (its a funky romantic feature) here. Matt Hanson, Director, A Swarm of Angels - another film.0 idea we featured a while ago. 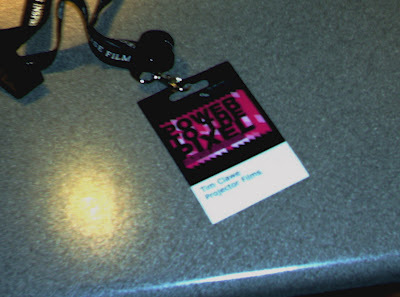 Power to the Pixel is a one-day forum that will connect the film community with key innovators of the digital revolution who are pioneering new ways of distributing, marketing and financing independent films. Leading filmmakers, entrepreneurs, networks and companies creating cutting edge distribution strategies will share their expertise on the latest digital tools and practices that are transforming the film business, as well as describing new ways of working in the digital environment. Do you have an idea for a creative product, service or business that you would like to get off the ground? Would you like the opportunity to share in up to £10,000 of no-strings attached start-up funding? Are you wanting to put your new ideas into action? Then 'InsightOut' could be just what you’re looking for. InsightOut is a programme of 5 one-day workshops looking at business planning and business set-up specifically designed for the creative industries and delivered in a totally new and interactive manner. Upon completion of the workshops, which will happen over the course of 3 months, the InsightOut ‘graduates’ will have the opportunity to pitch for a share of up to £10,000. To facilitate this each of the seven Insight Out programmes is delivered in partnership with a number of creative industry support agencies, cultural organisations, regional development agencies and Higher Education Institutions across the UK. 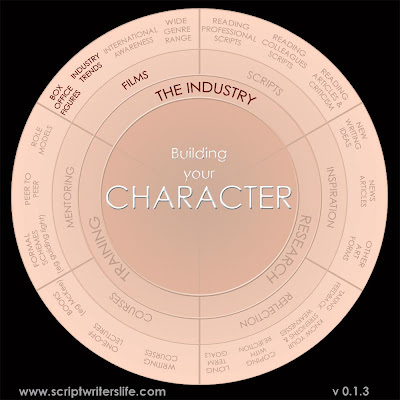 As I've been preparing to write some blog posts on The Scriptwriter's Life - and in particular Building your Character - I've been thinking about a wider trend I've noticed. Maybe it's always been there but it's whether we notice it or not that has changed over time. I'm talking about multi-dimensional people. People with a rounded character, who can draw on many interests. Who don't specialise. Other terms are generalist, polymath and, my favourite, Homo universalis. Perhaps the most famous is Leonardo Da Vinci whose work in art informed his science, or was it the other way around? Or was it that he saw them as one thing? You don't need to be a Leonardo though to be generalist. The painting above is by Rolling Stone legend Ronnie Wood who says the guitar, the piano, the paintbrush are just different tools to him. For many years we were encouraged to specialise. But these days jobs / techniques / roles change unbelievable quickly. The way around it is to have a wider knowledge. As you know this blog is about the worlds of the web, scriptwriting and film making. Its about how they cross over that I am interested in. Not about how they are separate. If I was just a 'pure' writer then I'd just be studying existing scripts, existing films and reading McKee etc. If I did that where on Earth would the new ideas come from? What's your broader interest? How does it overlap with writing? If you are a fan of the film Office Space then here is the cartoon it was based on. Yes! This actually was spun out to a feature!!! Amazing. Nano-movies my friend, a great way to make a pilot. Cheap to make - but can launch a career. You could sweat away for a year on one feature. Or write AND make 20 of these and sees what sticks and builds an audience. Hmmmm. Tough choice! Here is a new online video viewing site. It's more pro than youtube but not as locked down as Joost. You have to be a company to upload rather than an individual. But the benefit is an ad revenue profit sharing scheme and a healthy size of prize money for a launch festival. Unfortunately the viewer is PC only so far. From a viewers point of view (!) however it should be a great experience. The aim is all the fun of youtube but without the crap. Although sometimes its the crap that really makes youtube fun to use. By knowing about films with relation to The Industry I mean getting your head (and keeping your head) focused on what is happening on the front line. What's hot? What's not? Where are people, real people, handing over hard earned cash to see silly stories. And why? Some people have misinterpreted this as advice to write only what is selling - to write for the box office. This isn't what I mean at all. You may want to go that way. And hey - blocks always need busting buster! Instead what I mean is - know your cinema onions. What are the trends in the business? What sort or stories and characters are catching people's attention. As (ongoing) students of story that should be of interest to us anyway. But this piece of advice has a practical purpose as well. It let's you know which of your current projects on the backburner should be now on the front burner. It lets you know what films are 'hot' that you can compare yours to in a pitch. Do you still want to call it a Woody Allen style comedy in front of producers if you look at his Box Office figures of his last few films? And maybe, like me, you look to trends to see what is unpopular - so you can fill the gap and offer something different. For all those reasons it is sensible to have a rough knowledge of trends. How do you get that knowledge? 3 - IMDBs BO page. So keep an eye on the cash - and be a head-in-the-sand writer no longer! A new term is born (as far as I know). Who will be the first nanoscript professional writer? Who will make this their own as DW Griffiths made cinema his own? The race is on. YES! Back to the scriptwriter's life. Did we ever leave? We've had a good and complete look at the first circle - What is your story? In a way of course I'm wrong to tick it off. We haven't actually done it, finished it, slam-dunked it. We've only discussed it. 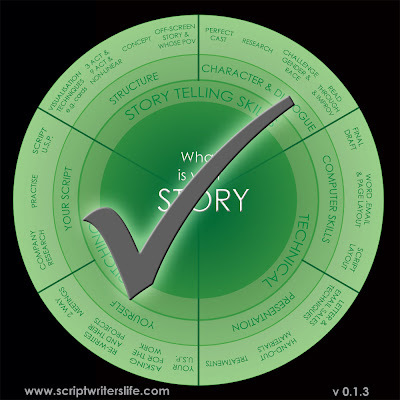 The actual process of keeping on top of your story telling skills, practicing your pitches and being technically up to date - all of these should be ongoing for top writers. But as I've been back into the writing myself recently, with new projects, my thoughts have turned to new scripts and new stories. Where do these come from? Most blog readers will know about my passion for 'collecting' bits of life and using them - what I call (rather pretentiously but in what I imagine is an endearing and funky way) Storydust. But HOW do we collect Storydust? How do we make sure we have something worth writing about? How do we know our scripts are any good? How do we keep getting better? Yes, my blog reading friends, the answer lies in red circle - in Building your character. And that, from tomorrow, will be the focus of the next part. Worth a mention is the fact that diagram itself has now been downloaded well over 3000 times. So if you need help with your 'reds' then you're in excellent (and numerous) company! 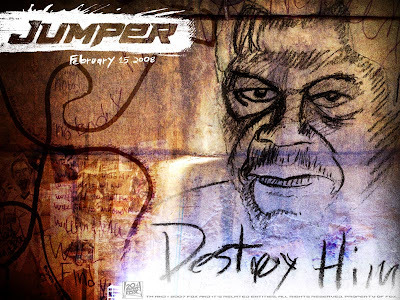 Doug Liman (Go, Bourne Identity) is directing a new film called Jumper. As you know, I normally like to credit the writer above the director but in this case I think Doug has been a bit choppy in requesting rewrites and in fact 3 writers are credited. Not sure why you need all those guys as it's an adaptation from a novel by Steven Gould anyway. The film itself is about people jumping about in space and time and other people who try and stop them - blah, blah. That aside, Doug said some interesting things about story in this month's Empire that chimed with the 'maverick writer' within me. Why does the person you're following have to the hero? Actually in my conversations with Fox there's a scene we've been debating where Sam Jackson's character has a very sympathetic moment with a kid. The usual reaction is 'He's the villain of the movie so you can't show him having cotton candy with a kid'. There are two sides to every story. The odd thing about this quote is that for script writers it throws up a debate about the difference between a protagonist and a hero. But 'real' people just read it and say 'dur - well, obviously'. Sometimes as writers we know too much. It's okay to go with common sense and feelings sometimes you know!